I’m hoping that in just under two weeks time I won’t be writing another entry with the same title, but used in a cycling sense – “to pack”, meaning to quit, to bail, DNF (did not finish). Banishing such thoughts from mind, I’ll quickly sum up my last weekend of preparation, which largely consisted of piling tons of stuff onto our dining room table, dismantling my bike into it’s box, and then shovelling said piles into the spaces around the frame. In fact, the whole process took far less time and was much easier than I’d expected – much to Yoli’s amusement, as she’d predicted I was being my usual overly pessimistic self about the scale of the task. Ben was also quite pleased that his pleas of “come play Daddy” got a result in a couple of short hours rather than taking the whole weekend. 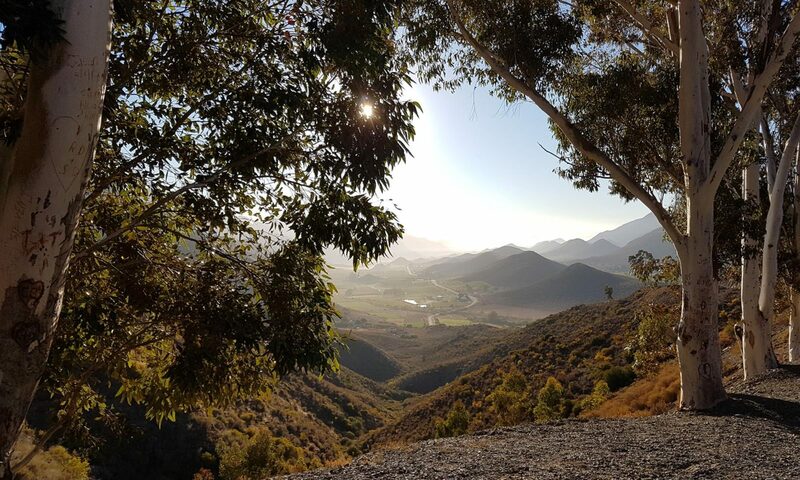 South Africa – goes without saying really, my adopted home and the place all this madness started. Hildebrand Pebbles – one of the two charities I have been riding for, and the shirt which has been on my back for all of the longer training rides. SufferFest – need I say more. I’m sure by the time this shirt goes on, I will reached the required level of self inflicted pain to be called a true Sufferlandrian. That job done, photographed, and posted to Facebook, next up was getting all the kit out and double checking it against my list. It seems bizarre that despite covering the whole of our dining room table, by conventional Audax standards I am actually travelling pretty light. 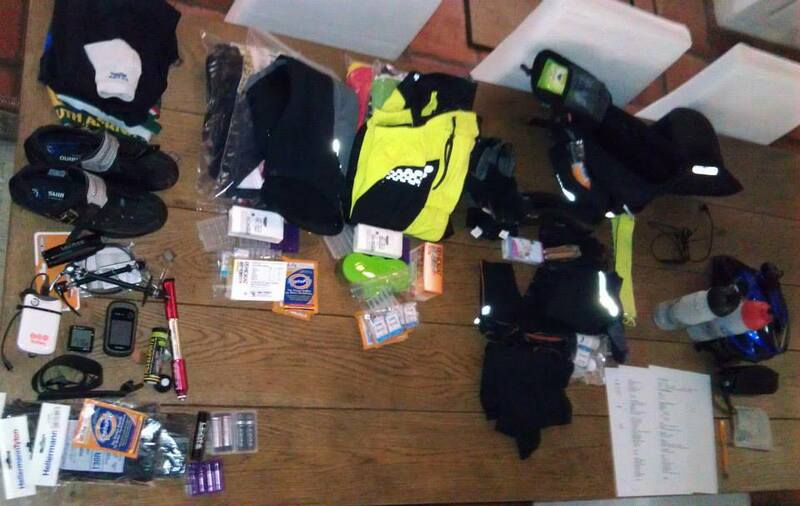 For all those who have seen me riding these last months and asked (or joked) about whether I had beers, coffees, or bricks in my saddle and bar bags, at the foot of this article is the complete kit list which can be seen laid in the photo. The final task was the one most concerning me – disassembling Jolly and packing her into the box. My fears were unfounded though, the step-by-step video offered by BikeBox Alan really was just that. Aside from one small panic where the handlebars seemed like they wouldn’t come off, it all came apart and packed in a dream. 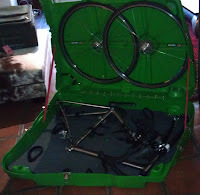 Predictably the mudguards wouldn’t really go in the box safely, so those went in my suitcase. But even with my odd arrangements of bag mounts and bar extenders, the handlebars didn’t seem to foul anything as the case closed up. Of course the proof of my packing will be in a few hours time when this flight to London lands and I see whether anything shook loose or broke in transit. And all of a sudden, I find I have little more to say. The preparation is done, and the ride is less than a week away. After a tearful farewell to Yoli and Ben at the airport, I’m sitting here with complimentary drink and snack in hand. I’m nervous and excited all at the same time, and I’m missing them both like crazy. 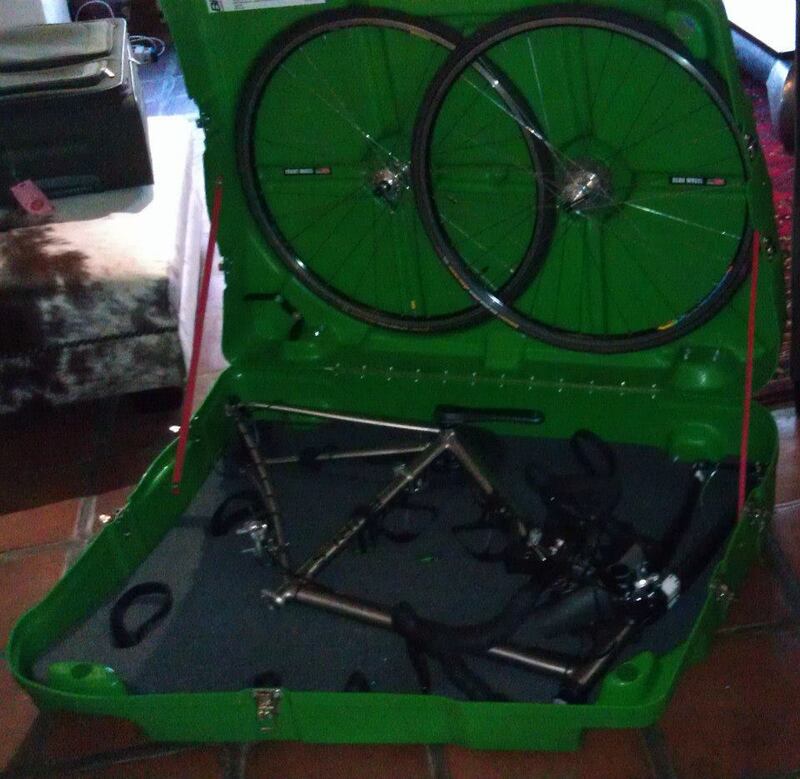 I realise I’ve already forgotten to take the first of the “en route” photos for this blog, which was meant to be me at the airport checking in my lurid greeen bike box – the colour specifically chosen so that I wouldn’t miss it, and no one could sneak off with it (I did mention I’m a pessimist). Hopefully it’s a few feet below me somewhere and I can at least snap a picture arriving at the other end. Jolly has picked up something like 10,000km in her inaugural year and a bit. Despite being probably five times what Merry did in each of the preceding five years, it now doesn’t feel like nearly enough. In truth though, it’s only short by 1,418 kilometres. And for those final few, it will up to my legs to do the talking now. Click here to move on to the pre-prologue – the day before the big day!